In this year, according to Square Enix, it's said to that Final Fantasy XIV's traditional lovey-dovey seasonal even Valentine's Day is coming back once more this year. Recently, the new update of Final Fantasy XIV, titled Rise of a New Sun, and this update is available for PS4 and PC, and including a massive update and rich content. You can see more images and screenshots on official website, source from FFXIV4Gil. 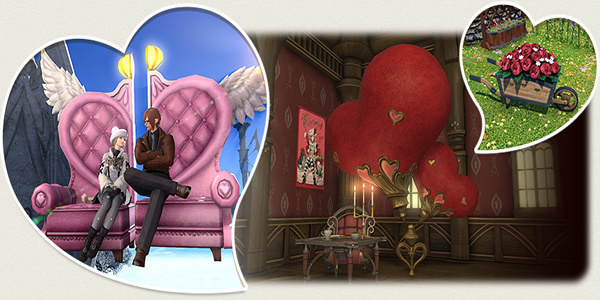 We will get two twin mounts in the form of a flying couch that can let us hover with our beloved ones as we amiably chat surrounded by pink velvet, a rose wagon, some Valentione's Day Balloons, and a Valentione's Day advertisement poster for our houses and apartments. If you want to learn more about Final Fantasy XIV, you can also enjoy our official page: https://www.ffxiv4gil.com/.